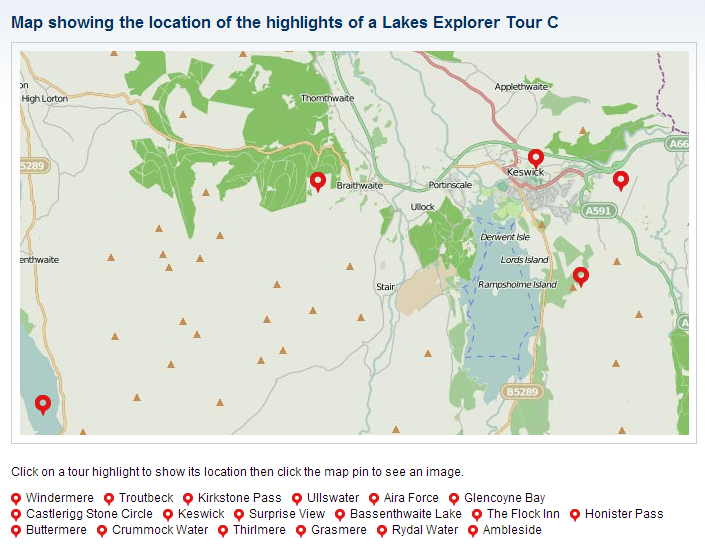 The brief: To design and develop interactive maps to show the routes of the tours that are offered to their clients, they have 5 tours in total. The maps need to include highlights of the tour and include a picture of these stops. 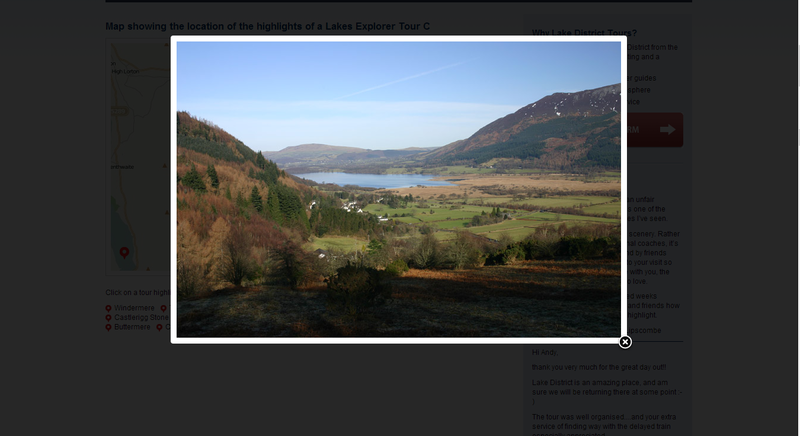 The Lake District Tours are a long term customer of ExtraDigital having built and designed all three of their websites (English, Japanese and Chinese).Lake District Tours offer different tours of the Lake District. Lake District Tours are informal, relaxed and informative with plenty of photo stops – many of these are planned but many more are unplanned to take advantage of spectacular weather conditions, local events or wildlife sightings. To find out more information visit www.lakedistricttours.co.uk. What we did: From the brief the client gave us we worked out the best way that this could be displayed. 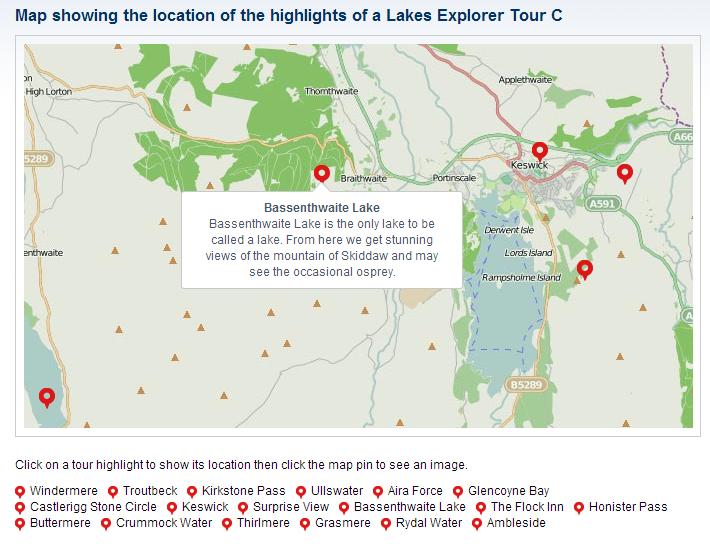 We decided to use openstreetmap as the base of the map as it uses better imagery for the type of area the Lake District is. The highlights were pinpointed on the map each point has a short description and an image. Each tour covers a wide area and because of this we could not show the whole tour on the overall map image. The pinpoints are therefore listed underneath each map so people can easily find information on each. The map will then move to this destination for the user to click on. When you put your cursor over the pinpoint you see information on the destination. To see the image appear you simply click on the pinpoint. We completed this for 5 tours in total. Clients Feedback: "Sorry for the delayed response it is a measure of how successful the website has been in attracting new customers that we have not sent our comments to you sooner! We are very impressed with the rapid turnaround in translation of our website into Chinese that has in the first season of operation generated a lot of positive feedback from Chinese visitors to the Lake District. The design of maps for the website to show off our tours proved to be complicated and required patience on behalf of Emma and her colleagues at Extradigital - their implementation of our detailed requirements was excellent."